There are moments of triumph and agony at every World Cup. During the tournament, there are men who become legends and men who become memes. Senegal coach Aliou Cissé has already become the latter, after his team claimed a convincing 2-1 victory over Poland on Tuesday. With his side clinching victory, Cissé fist-pumped, stared directly into the camera with a determined gaze, and rocketed to internet glory. The 42-year-old Cissé, who played for Birmingham City and Portsmouth in the English Premier League during his younger, more spritely years, is not your average meme. His reactions to the game on the touchline were very relatable and compelling. Naturally, the internet ran away with this, turning Cissé into the tournament's most talked about man, if only for a few hours. Cissé is unpredictable, gesticulation-wise. For example, what could this one mean? Is he trying to send mind-messages to his players on the pitch? Whatever the case, it appears quite effective! 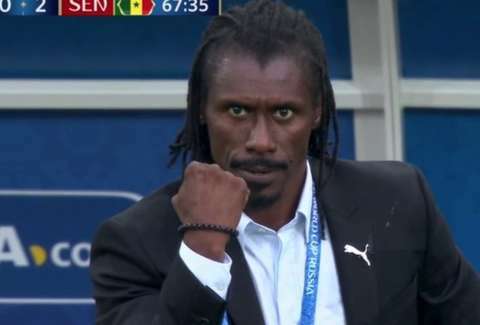 With only one match on the books for Senegal, Cissé has presented the world with a meme for every mood. He's got confidence in the state of African soccer, saying that a team from the continent is destined to win the World Cup eventually. Sam Blum would like Mr. Cissé to be his life coach. Follow him at @blumnessmonster.